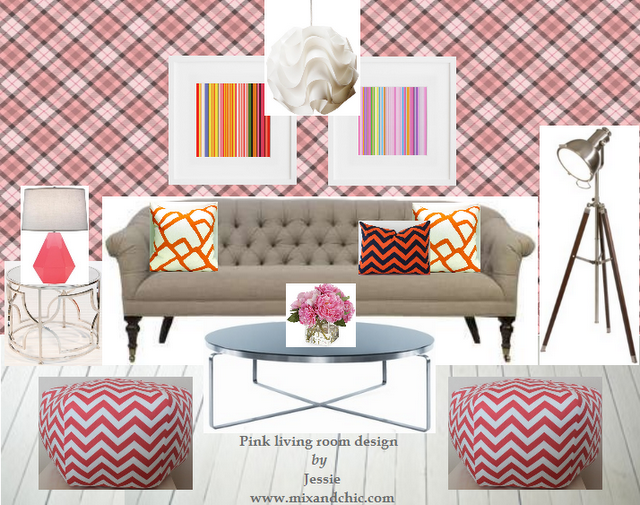 Mix and Chic: Moodboard- Pink Challenge At Finishing Touch Interiors! Moodboard- Pink Challenge At Finishing Touch Interiors! It's Monday again and it's another installation of moodboard challenge at Sarah's blog, Finishing Touch Interiors. This is the final challenge and it's named the Pink Challenge, an open challenge to help raise awareness for breast cancer. The rule being it can be any room as long as it is decorated in pink. I know I wanted to do a modern room right away and decided on designing a modern living room. The feeling and ambiance I was looking for is a young, fun and stylish modern space with a classic twist. It took me some time to find the right wallpaper but in the end it's worth it because it makes such a design statement. Here's what my moodboard looks like. What are your thoughts? Do you like my pink room? I wish I can replicate this design for my future mom cave because it's one of my favorite designs so far! If you are wondering what other designers come up with for this challenge, please click here. As usual, I love it! The sofa and the white floorboards are my favourite elements in this room but I also love the bold patterns! I am loving plaid right now. Jessie - great pink room. The table is fantastic! Looks great... really into pink these days! I love the sofa - can you tell me where it is from? Pink and gray is such a lovely color combination - and pink done in plaid makes it palatable for particularly pink-phobic persons like moi. Oh I LOVE this!! That wall paper is awesome; it keeps the pink from looking too sweet. And that couch is killer. Gorgeous room Jessie- I want a mom cave just like this too!! Anything with pink peonies is GORGEOUS!